The FARC rebel group, Colombia’s largest, makes enough money through illegal business that the guerrillas are able to pay for its war against the state, but what isn’t well known is exactly how much is left after these costs of war. According to a Forbes Israel report from 2014, the FARC makes $600 million a year, making them the third richest terrorist organization in the world after ISIS and Hamas. This is disputed because those who set out to know the full extent of the FARC’s finances have to rely largely on guesswork. “We are working on initial estimates of at least $150 million a year in FARC earnings, but you have to understand not all that money is ‘declared’ to FARC commanders. The reality is likely to be much higher,” said Jeremy McDermott, co-founder and director of InSight Crime, a Colombia-based website that has become an authority on transnational crime. McDermott, who spoke to Colombia Reports from the town of Briceño, Antioquia where he is studying the finances of the FARC’s 36th Front, said the group’s profits probably surpass their operating costs threefold. These operation costs are considerable as the guerrillas have been fighting a military force of 289,000 soldiers with an annual budget of $4.4 billion. 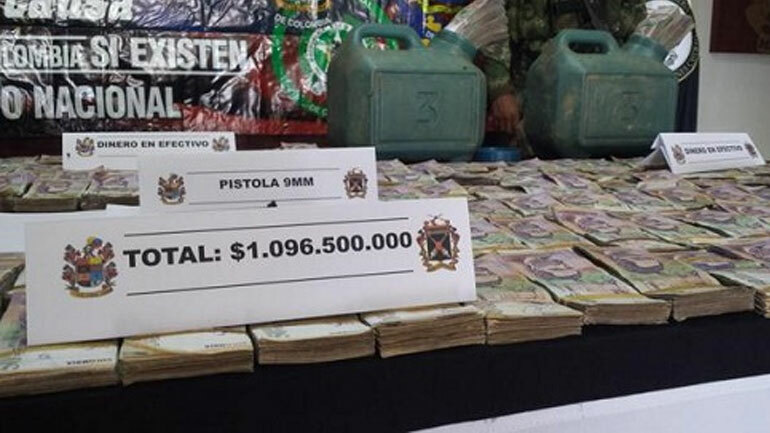 “Preliminary analysis would suggest that the FARC need around $50 million a year to fund themselves at current levels, including arms, munitions and militiamen, working on a total of around 8,000 rebels under arms,” McDermott said. This would leave the guerrilla organization at least an annual $100 million in profits, significantly less than alleged by Forbes. While the guerrillas are known to make their money from drug trafficking, extortion and illegal mining, they reportedly have other ways to finance their insurrection. Files on computers and other intelligence materials seized by the military after a raid on a FARC camp indicate they may also be getting help from outside of Colombia, a report in newspaper El Espectador this week said. Files on one such computer found in 2010, after an airstrike on a FARC unit that killed military leader “Mono Jojoy,” show that the rebels had a planned to borrow $30 million “from friendly oil-producing countries, to be paid within four to six years,” the report stated. Details of the alleged loan, now in the hands of the Prosecutor General’s Office, indicate that the funding would be paid in the form of gold, livestock, lumber or coal, and would be managed by the Secretariat, the FARC’s highest political body. It is not clear whether the loan was ever granted, or who the “friendly countries” were. The Marxist group reportedly also have sought to diversify their revenue streams, especially after the intensification of a military offensive in the first decade of this century, and ongoing efforts to curb drug trafficking. At one point, the Colombian government estimated that one third of income of illegal armed groups like the FARC came from illegal gold mining. In the southern department of Caqueta, the FARC took advantage of lands under its control to raise cattle, and created a front company to sell the beef it produced, according to a report in the Colombian magazine Pacifista earlier this month. In addition, the guerrillas are thought to have invested much of their finances in land, vehicles and even helicopters, the report noted. At one point, the rebels also explored a plan to extort Colombia’s big beverage companies. The idea was to pressure Coca Cola, Bavaria and Postobon into paying “protection,” and threaten to “close” their distribution networks if they refused, Pacifista said. Just how much money the guerrillas have in their coffers – thought to be in the hundreds of millions of dollars – is one of the questions they will have to answer if an eventual peace agreement with the Colombian government is signed. The FARC have proposed the Colombian government annually designates 3% of the country’s GDP, similar to $11 billion, for victim reparation. However, this money would come from Colombian tax payers and not from the profits made by the guerrillas themselves. But there has been little public debate about how, and how much, the FARC will spend to repair the damage they have caused, and to compensate their victims, which numbers are in the thousands if not tens of thousands.